Codonanthopsis is a genus containing approximately 13 species found primarily in the Amazonian basin area of northern South America, in Central America, and in some islands in the Caribbean. Codonanthopsis are epiphytes with a trailing growth habit. They grow well in hanging baskets. It is unclear why Codonanthopsis are not more popular in cultivation. The etymology of the genus name comes from Codonanthe and the Greek suffix -opsis, which means “looking like.” So, the name means “looking like Codonanthe,” which seems appropriate since many of these species were once in genus Codonanthe. In the wild, Codonanthopsis has a close relationship with ants. Ants use the fibrous roots from Codonanthopsis to support their ant mounds, and the ants feed from the nectaries found underneath the leaves. In return, the ants distribute Codonanthopsis seed to other locations. Codonanthopsis is closely related to Nematanthus and Codonanthe. They are all within the same clade of Tribe Episcieae in the New World subfamily of gesneriads Gesneriodeae. More recent DNA testing from 2013 revealed that Codonanthe is more closely related to Nematanthus than to Codonanthopsis. Nematanthus and Codonanthe grow in the same geographic area, and they share the same number of chromosomes (2n=16). In comparison, Codonanthe and Codonanthopsis differ in their geographic locations, their number of chromosomes, the shape of their fruit, and the presence of corolla spurs, extrafloral nectaries, and anther connective tissue. 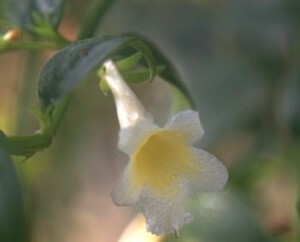 Hybridizers have been able to create intergeneric hybrids between Codonanthe and Nematanthus, but there are no known intergeneric hybrids with Codonanthopsis. Codonanthopsis grow well in a well-drained soilless mix and under a 2-lamp fluorescent light shelf. Higher humidity levels well over 50% would induce better flowering and fruit production. Codonanthopsis can usually adapt to higher temperatures than Codonanthe.